Yep, as of last week, I am officially no longer a resident of Palermo Soho (also known as “The Bubble” for its large concentration of expats). I am now a resident of the lovely neighborhood of Belgrano. And, as you can see from the map of Buenos Aires to the right, while it wasn’t a huge geographical move, it was a big one in terms of neighborhood differences. Now, don’t get me wrong, I love Palermo Soho. 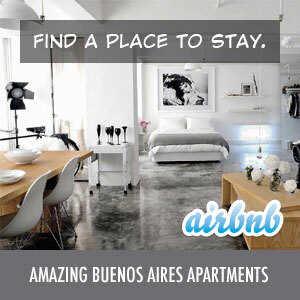 It’s a great neighborhood to be in when you first get to Buenos Aires. It offers a ton of things to do – restaurants, bars, clubs, shops and services. And, if your Spanish is a bit weak, you can pretty easily get by with English. However, those things come at a price. Palermo Soho tends to be one of the most expensive neighborhoods in the city. By making the move to Belgrano, we were able to get an amazing apartment at a price that we never could have gotten in Palermo Soho, plus it is considerably larger and higher (see the photo) than most Palermo Soho options. The area of Belgrano that I’m in is filled with high-rise apartment buildings in what tends to be an upper middle-class family neighborhood. The main avenue of Cabildo is a few blocks away and features tons of shopping as well as the “D” subway line which makes it easy to get around. I’m also close to Buenos Aires’ Barrio Chino (“Chinatown”) which is an added perk for both speciality grocery shopping and restaurants. I now have four ATMs within a 2 block radius. I was so used to walking numerous blocks in Palermo to an ATM, and then having to walk a few blocks more when that one was out of order or simply out of cash. Unfortunately, there is not a Romario Pizza that delivers here. There is a new Almacen de Pizzas which is fair, but not as good as Romario. I’ll have to continue to explore my options. Palermo Soho definitely has a higher density of restaurants. You do not hear English as much here. When you walk down the street in Palermo Soho and you’ll hear as much English as you do Spanish. That is not the case in Belgrano. I miss knowing my way around. After a year and a half in Palermo Soho, I pretty much knew all the streets and where everything I needed was. I’m still pretty confused with the layout here, but I’m sure that will come with time. I have yet to hear drunk people screaming on the streets at 6am as they leave the bars and clubs. This was a pretty common occurrence in Palermo Soho, but I think Belgrano is missing out on this. So, those are my first impressions. I’m sure I’ll be posting more as I find my way around and get to know my new barrio.